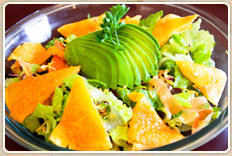 Our original signature salad made with fresh greens, avocado, bacon, raisins, sunflower seeds, shredded cheddar and mozzerella cheese and our famous sunshine nacho chips. Choice of dressing includes; homemade ranch, blue cheese, honey mustard, 1000 island, zesty italian or picante sauce. Baked especially for Sunshine Café, our extra thick french toast has a generous amount of cinnamon baked right in the middle. 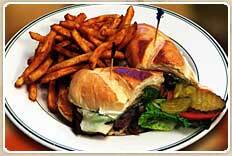 Accompanied with a choice of thick-sliced bacon or jumbo sausage patties. A generous portion of lean roast beef grilled with fresh peppers & onions and served on a fresh french roll baked exclusively for Sunshine. Served with a choice of seasoned fries, georgia cole slaw, homemade potato salad, cottage cheese, or fresh fruit. 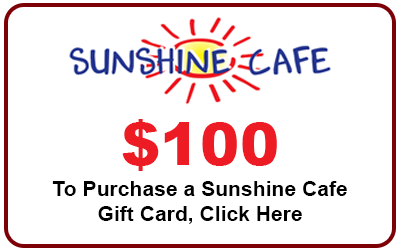 A Sunshine favorite! 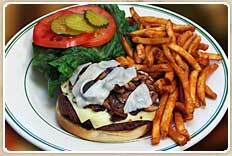 One of a dozen choices of burgers at Sunshine Café. A truly fresh ½ lb. ground beef patty, char-broiled to order and topped with fresh sauteed mushrooms & melted swiss cheese, and served with a choice of seasoned fries, georgia cole slaw, homemade potato salad, cottage cheese, or fresh fruit. Best burger anywhere!! 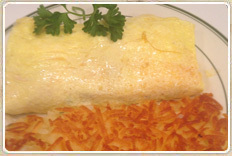 Sunshine's omelettes are carefully made on the griddle and folded french-style. The most popular omelette on the menu combines fresh california avocado, smoked turkey breast and shredded cheddar cheese. 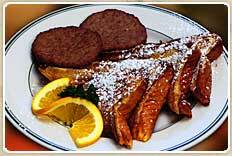 Choose from seasoned home fries made with red rose potatoes, shredded hash browns or fresh fruit and choice of toast. 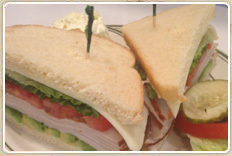 Served cold, this simple sandwich features lean smoked turkey, monterey jack cheese, lettuce and tomato on your choice of white, wheat, rye or sourdough. Ham or roast beef may be substituted. Served with a choice of seasoned fries, georgia cole slaw, homemade potato salad, cottage cheese, or fresh fruit.